improving day 14: That’s RIGHT! So today I have been wondering what to write about today. It’s one of those days that I feel I didn’t “do anything,” I am tired and still have a meeting to go to tonight. What did I actually do, dropped kiddo off at pre-school, went to the market, came home put away the groceries, switched the laundry, went to friends house for coffee and blogging talk, picked up kiddo, went to Michael’s craft store, went to Cost-co, came home unloaded Cost-co and put it away, made lunch, went to friends for play date, came home made dinner and now sitting at laptop watching Dora the Explorer trying to blog before I have to leave for my meeting. I guess I did do quite a bit. While at play date, my dear friend Liz, was talking about an artical she read that circulated Facebook. 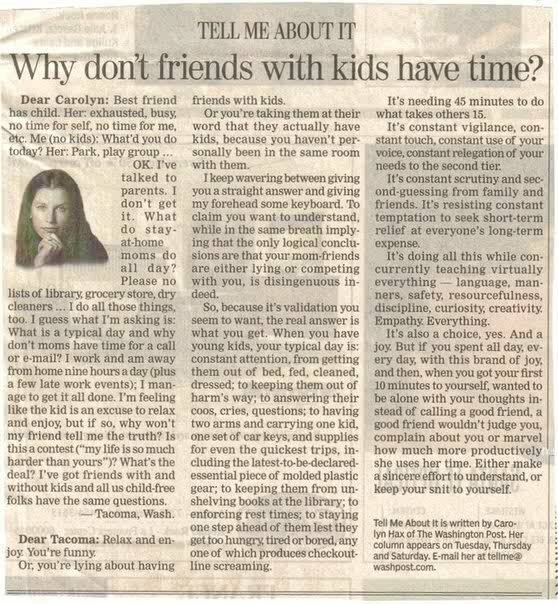 It’s about a women with out children wondering what stay at home moms really do all day, and why when they have a free moment they just want to be alone. so true…everyone needs to read this!